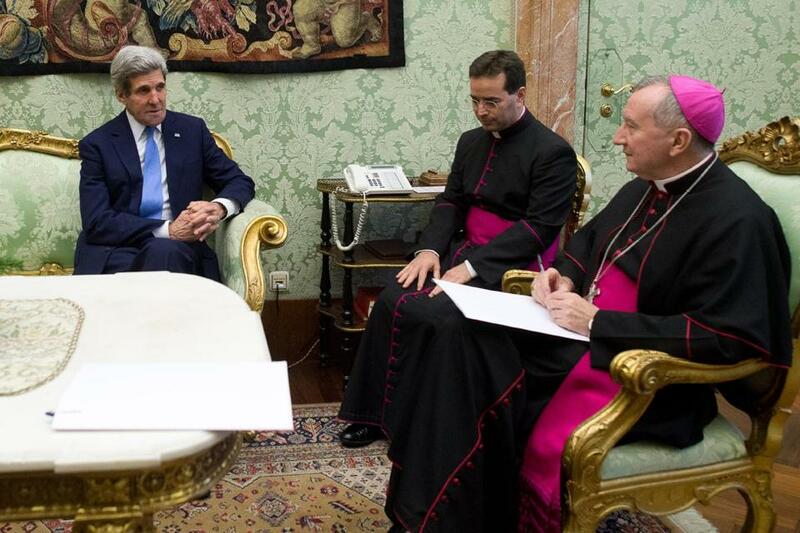 US Secretary of State John Kerry (left) spoke with Vatican Secretary of State Archbishop Pietro Parolin (right) in January. We are starting to make progress. I’ve instructed the Trafficking in Persons Office at the State Department to zero in on the way modern slavery entangles with economic and environmental concerns. This is one powerful example of how we are engaging with faith communities to solve a range of global issues of mutual concern, in partnership with the new Office of Faith-Based Community Initiatives at the State Department, led by Dr. Shaun Casey, whom I recruited from Wesley Seminary. As Christians the world over celebrate Easter, this is a fitting place to fix our gaze. Christ found his earliest followers off the shore of the Sea of Galilee. He brought them off their fishing boats to become his apostles, to spread his message of love and compassion. Particularly at Easter, this is a message that can guide people of all faiths. When we embrace our common humanity and stand up for the dignity of all people, we realize the vision of a world that is more caring and more just — a world free from slavery. John Kerry was US senator from Massachusetts before he became secretary of state.